Located at the eastern end of Waiheke Island, in New Zealand's Hauraki Gulf, Man O' War boasts a pristine and beautiful spread of coastal hillsides with high cliffs and stunning beaches. This rugged and beautiful coastline was "discovered" in 1769 by Captain James Cook, and today we take responsibility for maintaining its beauty and integrity for future generations. Under our family's stewardship for almost 30 years, we first introduced grapes to Man O' War in 1993, firm in the belief that world class wines could be produced here. Since then we have carefully selected and developed almost 90 individual pockets of Man O' War's hillsides for wine growing, each chosen for the unique and exceptional qualities they bring to our wines. Today 150 acres of vines are strategically placed around Man O' War's 4500 acres, enhancing its intrinsic beauty. Meticulous design ensures that the distinct soil profile and microclimate of each block is used to best advantage with different rootstocks, clones and planting densities selected to match the specific terroir on offer. 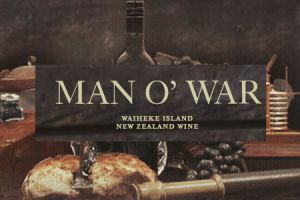 At Man O' War an exceptional and passionate team of people come together to bring you unique world class wines that reflect the distinctive treasure of land from which they come. Our winemaking team possesses broad and extensive experience and we pride ourselves on fusing classic Old World techniques with innovative New World ideas.